Some time ago, I wrote a piece entitled The Chicken and the Pig explaining how a worker experiences a paradigm shift upon retiring, and another that I called Think Like a Bayesian Pig. Suddenly, upon retiring, conserving our wealth becomes far more important in our personal perspective than building more. I spoke on the topic at the RIIA conference in Charlotte last year. 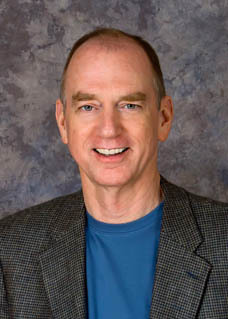 The Retirement Income Industry Association was founded by Francios Gadenne. The first time I met Francois, we discovered that we had come to retirement planning in the same way. Both from the tech industry, we had found ourselves able to retire early, but couldn't find a retirement planner with whom we were comfortable. We each set out to improve that situation, Francois by creating RIIA, and me by blogging. Francois has probably reached more people more effectively, but I'm funnier. My goal is to have the funniest, most entertaining retirement finance blog on the web, which is, as you might imagine, a very low hurdle. It's good to have a brand. I guess. For those of you who, like me, haven't been to Indiana in decades, I can report that it is still very flat, but I learned things last week that are more relevant to a retirement blog and I'll share them with you. Dr. Moshe Milevsky gave a fascinating presentation on tontines, a medieval predecessor of life annuities. (Who knew it was even possible to give a fascinating presentation on annuities?) Moshe has written a book, King William's Tontine, which I have not yet read, but if it's anything like his presentation, I will love it. A typical fact from his presentation: when England’s King William used a tontine to fund a war with the French, several shares were bought by Frenchmen. Now, that’s what I call a hedge. Dr. Milevsky (@RetirementQuant on Twitter) gave us another of his books, co-authored with Alexandra Macqueen, CFP, entitled Pensionize Your Nest Egg. I haven't read it, yet, but I did give it a thorough skimming. I found the following table (double-click to enlarge) that I thought you might find interesting. 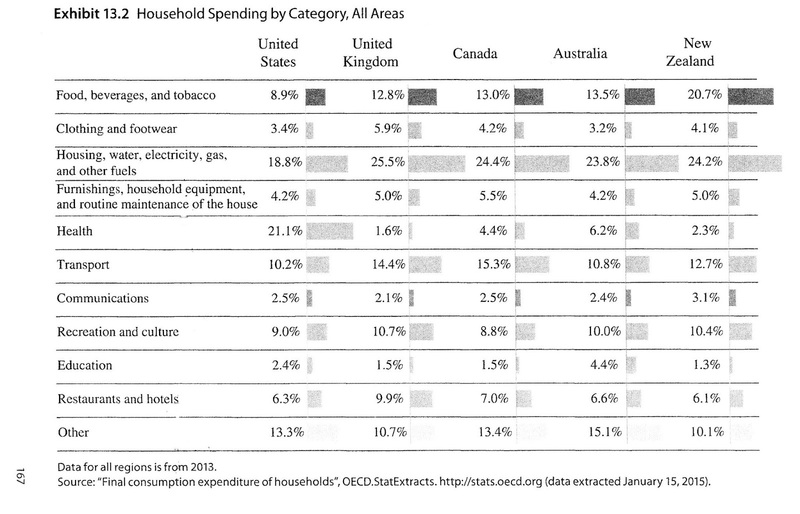 Look at the percentage of our budgets that Americans spend on Health compared to other countries. Scary stuff, and getting worse, but not at all surprising to me after my own ten years of retirement. As with all conferences, some of the things we learn come from the attendees. One attendee pointed out that enough insurance companies that offer annuities have been bought out by private equity to alarm New York state's insurance regulators. The dramatic number of acquisitions has raised alarms in some circles about the safety of life annuities. There doesn't seem to be enough evidence to suggest that annuities are now at risk, but it's a topic we should all probably keep an eye on. There is just very little hard evidence that more than a thimbleful of stock pickers and market timers (think Dodd and Buffet) can outperform. In my experience, contrary to the evidence, many individual retirees feel certain that they are in that thimble or that they can find a magical advisor, blogger or investment club that is. Swedroe wrote a book on this topic entitled The Incredible Shrinking Alpha, which I also downloaded to my Kindle and plan to read soon. For a shortcut, read Michael Kitces' outstanding summary. Dr. Steven Huxley of Asset Dedication, and his co-founder, Brent Burns, discussed their company's strategy of implementing floors with individual bonds (they prefer agency and other Treasury bonds). When asked their reasons for eschewing annuities in the floor, they replied that their major objection to life annuities is cost (they optimize safety and cost) and added that the constant cash flows of annuities don't match the variable spending requirements of most retirees. I would add that annuities and bonds aren't an “either-or” decision and that variable cash flows can be achieved with a combination of the two. Finally, Dr. Brigitte Madrian also received an award at RIIA’s Fall Conference. Fortunately for me, my award was presented first. If I had to follow her presentation on her research, I would've feigned illness and hidden out in my room. Dr. Madrian's research on how we use 401(k)'s changed the industry and Federal regulations. Essentially, she uncovered the total irrationality with which most workers make decisions about their 401(k). The scary part is that her sample was comprised solely of Harvard students, graduates, faculty and staff. So, if you invest your 401(k) in all cash, or all in your own company's stock, or you pick your savings withdrawals in 5% increments (“no one picks 7% or 13%”), you’re making poor choices but you're in well-educated company. Wade Pfau, Michael Finke and several other retirement researchers of note also attended. Here are some of Wade's thoughts on the conference. To paraphrase Garrison Keillor. . . that's the news from Lake Wobegon, where all the women are strong, all the men are good-looking, and all the stock returns are above average. And thanks. It was fun, Especially St. Elmo's, although the horse radish blew out the sinuses on the left side of my face. Re: health costs on the chart: where's the line item for taxes? might that make a difference? Also, what exactly does that "health care" comprise? Might you be comparing apples and oranges? I don't know, so I'm asking. A further look at Moshe's book tells us that the table reveals some of the largest expenses for average households. 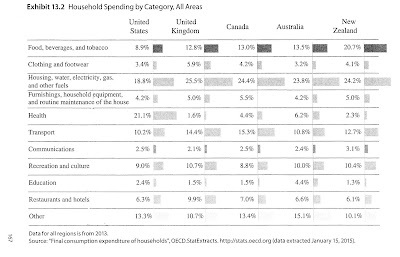 It also says that "a big item in many household budgets is income tax, which is not shown in our table. . ."
Not sure that helps much. I just can't answer your question. Sorry. I just wondered if the much higher USA health costs correlated to (perhaps!) lower taxation levels than are present in some other countries. If a country has nationalized health care, I presume the costs for that would show up on a tax line instead of a health care line--- but I don't know. Thanks for a fun and thought-provoking blog.. I don't know the answer to that question. The chart didn't raise any eyebrows for me because tons of data has been published indicating that our medical care costs way more than anywhere else and the health outcomes are exceedingly poor. Also, the amount of health care costs I have paid in 10 years of retirement would astound you (or at least they did me). I would be surprised if costs are hidden in taxes, but you ask a good question. Let us know if you find anything interesting. Those are EXCELLENT questions, the kind that everyone should ask about any research. Any of those possibilities might be correct. But, I'm personally not comparing anything. The work was done by OECD. They have a wealth of data at their website, where I suspect you can find your answers. If you find anything nefarious, please share! Sorry I didn't have a quick answer for you, and thanks for writing. I wrote the people who developed the report and asked. I'll let you know if they respond. Actually, not sure why you believe Harvard students, graduates, faculty and staff would be any better at investing. Regardless, the times they are a changing. If you look at current survey data, you'll see an ever larger percentage of 401(k) participants who have "help" in investment decision-making. This shows up in the dramatic shift of assets to target date funds/target maturity models/balanced funds - and the dramatic shift away from investments in employer stock. My point is that, with respect to the 401(k), where we have been is not where we are headed. My savings plan of 30+ years ago bears no relationship to the retirement savings plans my son, 30+ years my junior, participates in today. Oh, I don't believe the Harvard-educated should be "better at investing", I believe they should make better decisions than do less-educated workers. Two entirely different issues. I don't believe anyone is "better at investing", if by that you mean picking better investments. Picking the same investment with a higher price tag? That's a poor decision. Oops! Hit the send button too quickly. Your point that 401(k) investing is on a better track is my point, as well. Many of the improvements are a direct result of Dr. Madrian's research. I've never been a fan of annuities, but the idea of buying an annuity with a reputable & solvent company, then having it bought out by some private equity group which could load up on debt and put my entire income at risk really kills of my interest in annuities. There are some things that should be illegal. I think the State of New York shares your concern and, frankly, New York state leads the way in insurance regulation across the nation. As I said, I think this is something to keep an eye on at this point, but I do agree that it isn't a confidence-builder.